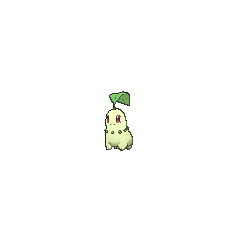 Chikorita in game: 4,392 Who? Important notice! Pokemon Chikorita is a fictional character of humans. 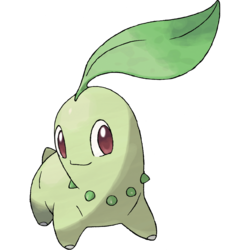 Chikorita is a small, pale green Pokémon with a darker necklace of buds. It has a large head in proportion to the rest of its body with large red eyes that appear to have no pupils. It has four short legs with a single nailed toe on each and a small tail. Its most distinguishing feature is the large leaf on the top of its head, which is usually longer than the rest of its body. Aside from the soothing aroma that wafts from its leaf, Chikorita uses its leaf to determine the temperature and humidity of the surrounding air. Ash captured a Chikorita in The Chikorita Rescue. It had such high affections for Ash that sometimes came to a few faults, such as refusing to be switched out for Pikachu. Ash's Chikorita evolved in Current Events. 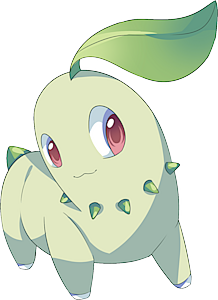 Casey's Chikorita was first seen in The Double Trouble Header. It was Casey's starter Pokémon. It evolved into a Bayleef in The Bug Stops Here, and later evolved into a Meganium. Chikorita is Vincent's starter Pokémon that he received from Professor Elm. Silver also owns a Chikorita, as seen in The Search for the Legend. It behaves much in the same way to him as Pikachu does to Ash, including traveling on his shoulder. Another Chikorita, under the ownership of Lyra, appears along with Totodile and Cyndaquil in An Egg Scramble!. It battled Dawn's Piplup. It also subsequently appeared in Bagged Then Tagged!, where it participated in a tag battle against Ash and Dawn. Chikorita has a role in Arceus and the Jewel of Life alongside the other Johto starters, Cyndaquil and Totodile. 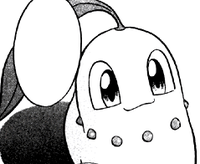 A Chikorita appeared in PK23 and Meloetta's Moonlight Serenade. Professor Elm showed a photograph of a Chikorita to Ash and his friends in Don't Touch That 'dile. Vincent received a Chikorita as his starter Pokémon as seen in the opening of The Legend of Thunder!. A Chikorita appeared in Off The Unbeaten Path!. It was in a field with Aron, Azurill, Smoochum, and Igglybuff. A Chikorita under the ownership of a Pokémon Stylist appeared in the Hearthome Collection in Arriving in Style!. A Chikorita was used by one of the participants of the Pokémon Ping Pong Tournament in To Thine Own Pokémon Be True!. 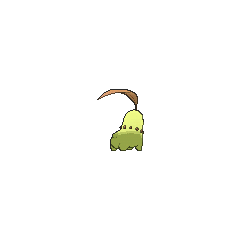 A Chikorita appeared as a mask for the festival in Capacia Island UFO!. 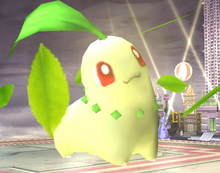 A Chikorita appeared as a plush toy in A Jolting Switcheroo!. EP126 Chikorita Ash's Pokédex Chikorita, the Leaf Pokémon. Chikorita emits pleasant aromas from the leaves on their heads and they love to sunbathe. In Pokémon Adventures, Chikorita is the last of the three starter Pokémon to get a Trainer (in a similar fashion to Treecko never getting his rightful Trainer until Emerald steals him as a Sceptile, much later than the other two starters had) he debuted in Murkrow Row. He escapes from Professor Elm and follows Crystal until she decides to accept him to her team, where hehad to pass a test. Crystal's Chikorita wears a star pendant, formerly owned by Smoochum, who accepted Chikorita when her Trainer did. He later evolves into a Bayleef to protect Crys from a Larvitar, then into Meganium during a fight with Lugia along with the other two Johto starters. Crys nicknamed him Megaree*/Mega*. In battle, Chikorita waves its leaf around to keep the foe at bay. However, a sweet fragrance also wafts from the leaf, becalming the battling Pokémon and composing a cozy, friendly atmosphere all around. It waves its leaf around to keep foes at bay. However, a sweet fragrance also wafts from the leaf, composing a friendly atmosphere that becalms the battlers. The Chikorita family is the only evolution family of a starter Pokémon to not have their names changed for the English release. In both early artwork and the in-game sprites of Pokémon Gold and Silver, Chikorita's body is yellow. This was later changed to light green in later artwork and the Pokémon Crystal sprites. The green Pokémon mini was modeled after Chikorita. A prototype of Chikorita called Happa resembles a Chikorita without legs.